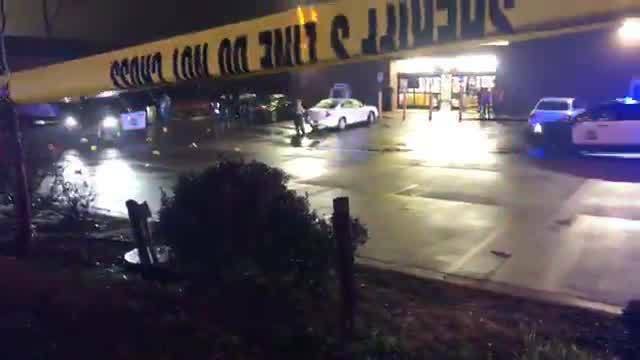 AUBURN, Ala. (WIAT) -- The Auburn police officer injured in a shooting Friday night outside a Dollar General on Opelika Road has been identified by family members as Justin Sanders. Auburn Mayor Ron Andes expressed his condolences and support for the Auburn Police Department and Sanders' family today in a statement. "We are thankful this morning that Officer Sanders is recovering from his injuries received in the line of duty last night," Andes said. "Our thoughts and prayers are with him and his family as he recovers. As a community, I know you join me in thanking him in the bravery that he and those that came to his aid displayed in protecting and serving all of us. I know his family is hurting that this happened. So are we all. We will continue to pray that his recovery is as swift as possible." Hospital personnel said Sanders is recovering from his injuries today. The suspect, 38-year-old Christopher Wallace, and a 36-year-old unidentified woman present with him during the shooting both died at an apartment fire after fleeing the scene. A preliminary examination by the State Medical examiner indicates that they both died as a result of gunshot wounds. It appears that the female initially sustained a fatal gunshot injury followed by Wallace sustaining a self-inflicted fatal gunshot injury. Weapons consistent with causing the fatal gunshot injuries were recovered next to the bodies at the scene by law enforcement. The case remains under investigation by the Auburn Police and Fire divisions, Opelika Police Department, ALEA's State Bureau of Investigation, State Fire Marshal’s Office, State of Alabama Medical Examiner’s Office and the Lee Coroner’s Office.